One of the things I miss most about San Jose is my beloved little bagel spot. It was a cozy little family-owned bagel shop that was a gem of the community. The staff were some of the nicest people around and even when I would fumble in at 6am, they would always greet me with warm hellos—-and of course my cheese bagel with jalepeno spread. AH-MAY-ZING! I’ve really been missing those delicious bagels lately so when I saw the post on Tasty Kitchen for homemade bagels, I knew I had to give them a try. Meredith’s take on them were straight forward and easy to follow. I especially appreciated the short proofing time—which is always a plus in my book! I really liked the texture of the bagels as it yielded the lovely chewiness that I am so fond of. However, after my bagels cooled down, they began to flatten out. She had commented to another reader that this may happen when you let the dough rest too long but I only had mine out for about 20 minutes. I was a bit Sad Panda but I would love to try it again and substitute some of AP flour for wheat. Nonetheless it was a fun recipe to make! In the bottom of your mixer bowl, combine 2/3 cup water, sugar, and yeast and let the yeast develop for about 5 minutes. Add in flour, vegetable oil, and salt and mix with a dough hook (or by hand) until the dough is elastic and tough. You may need to add in a bit of extra water, but do it little by little. Let the dough sit and rise in a warm place for 20-30 minutes. Turn dough out onto a floured surface and knead. Cut into 6 equal pieces. Roll each individual piece into a “snake” long enough to wrap around your palm. Dip each end of the dough in water and press together in your palm, forming a circle. Place the formed bagels on a floured board and allow to rise another 20-30 minutes. Bring 6 cups of water to a boil in a heavy-bottomed pot. When the water is gently boiling, place 2-3 bagels into the water for 1 minute and then flip to boil on the other side for another minute. 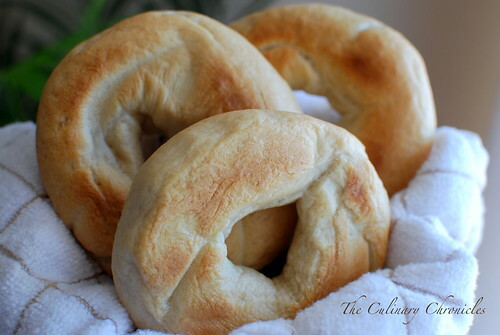 Remove the bagels, place them on paper towels to take off excess moisture, then place on a baking sheet. Repeat with the remaining bagels. Bake in the oven on 425 degrees for 18 minutes, turning them over after 10 minutes. Cool on wire racks and enjoy! 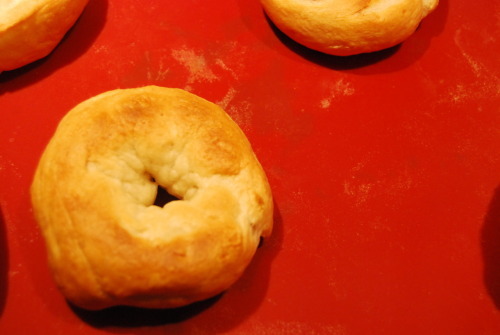 Oh Nam – thank you for a reliable bagel recipe that doesn’t make a huge amount. Six at a time will do me nicely. My dear Dad has given up on the “roll the dough into a snake then join the ends” method, instead he forms a bun shape then makes the hole in the middle with a wet finger – it works brilliantly for him (and at 80 he has earned the right to do things exactly as he chooses!). I have always wanted to make bagels at home. This is the post to get me started. Thanks! Made some tonight (was Saturday evening here) and only 2 of the original 6 remain. The texture on the crust and the inner is just wonderful – and my dear Dad’s method for making the bagel hole worked a treat. Only, I’ll have to make another batch to ensure I have supplies for the working week! Michelle down in Wellington, NZ. You are my go to for Bun Thit Nuong, best recipe ever! Next time you make bagels, try using potato water for the boiling step. ( A pot of water that you boiled a potato in) That is the method my grandmother used who was a baker in Poland. I ‘m looking delicious bagel ~bagels bread made ​​of bark and wrinkles contributor Any ideas why this quality. .